Tea Wok... Where have I seen that name before? Wait, there was Tea Work which was formerly located on 41st and Victoria. 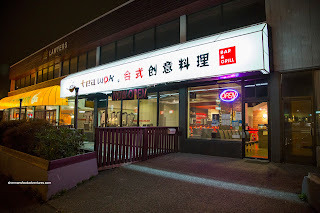 There was another I believe on Kingsway at Nelson in Burnaby as well (now a Szechaun Chongqing). Were they all related? If so, I wasn't holding too much hope for the food. But when we were thwarted at The One with a long lineup (when does that ever happen? ), Milhouse, Lionel Hutz and myself had to resort to alternative measures in obtaining late night eats in Burnaby. So we ended up at Tea Wok in the former location of 508 Bistro. 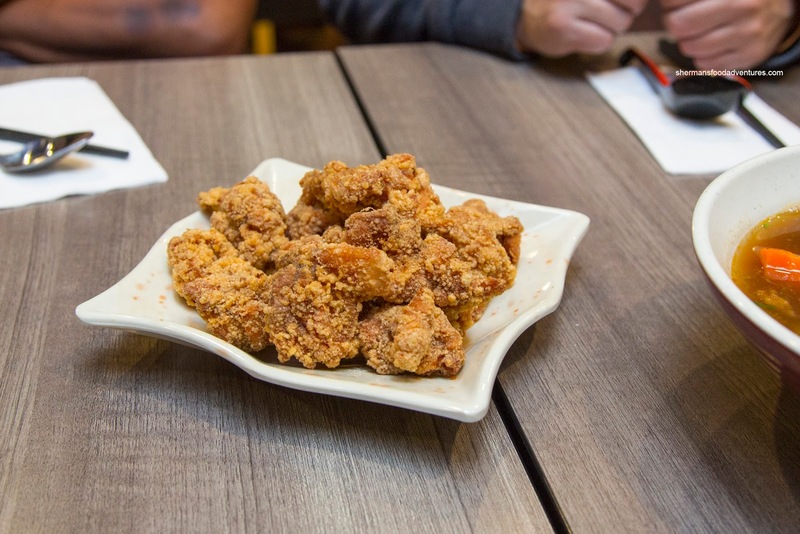 We started with 2 classic Taiwanese appies including the Deep Fried Chicken Nuggets and Red Fermented Deep Fried Pork. Fairly large in portion size, the chicken nuggets were crispy, almost crunchy on the outside. It was nice spiced where there was definitely a salty peppery thing going on. However, we didn't get much five spice. As much as the exterior was well-seasoned, the chicken itself was bland. It was juicy and succulent though. Appearance-wise, the pork cutlet looked legit with an appealing red hue. Unfortunately, it was completely devoid of any of the classic fermented pungency. Furthermore, the batter was greasy and slid off. Inside, the pork itself was rather dry and chewy. For his main, Milhouse had the Dried Noodles with Minced Meat Sauce and stewed egg. For $6.50, this was a substantial dish with slippery and chewy noodles. 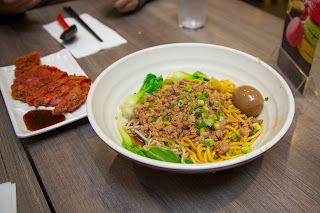 The meat sauce was sweet and flavourful where it completely seasoned every strand of noodle. I would've liked to see more viscosity as the sauce was pretty watery and didn't actually adhere to the noodles. As a result, the meat sat on the bottom of the bowl. Lionel Hutz went for the Satay Shredded Pork Pan Fried Noodles which the server misheard as seafood noodles. We give them credit for correcting the problem no questions asked. As for the the satay noodles, they were al dente and fully spiced with satay. There was minimal moisture which meant there was decent wok heat. 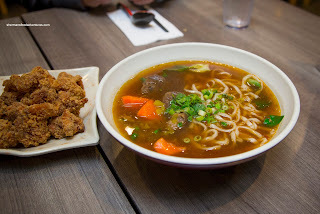 For myself, I went for the standard being the Taiwanese Beef Noodle. It was too bad that the broth itself was rather weak and lacking in depth. In fact, the pickled mustard greens was the dominant flavour. However, the noodles were toothsome and the sliced beef shank was melt-in-my-mouth tender. 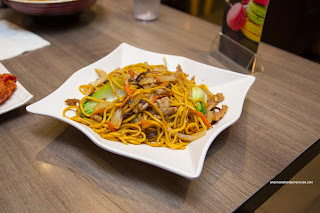 So due to our low expectations, the stuff here at Tea Wok did the job, especially for late night. 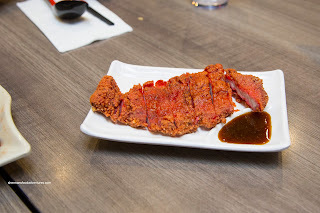 However, for Taiwanese cuisine aficionados, you better best move on because there are too many deficiencies to overlook.